I have a super soft corner for sparkly and shimmery items. 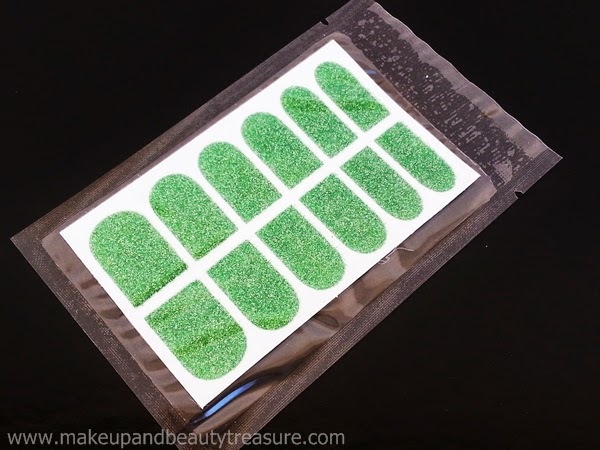 Though I would never apply shimmers on face but I really don’t mind them on my nails, eyes and oBorn Pretty Store Green Nail Wraps. Price: Not sure. Currently out of stock! 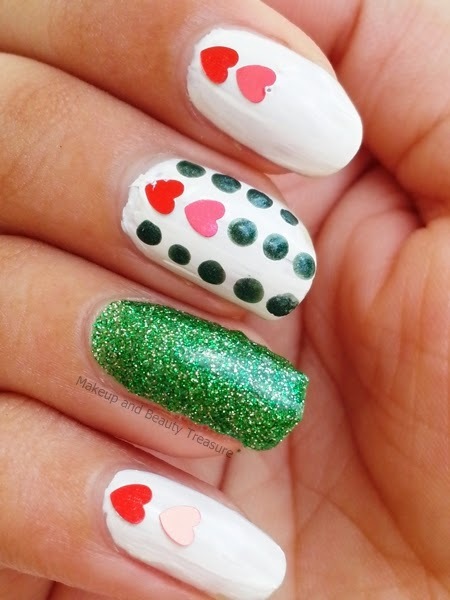 Buy other nail wraps HERE Use the coupon code MEGW10 to get 10% off on your order! 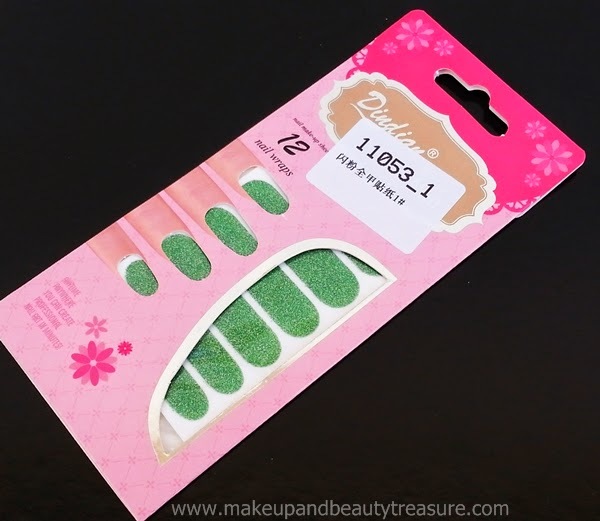 Born Pretty Store Green Nail Wraps comes in a pink cardboard casing with the information written at the back in Chinese language. 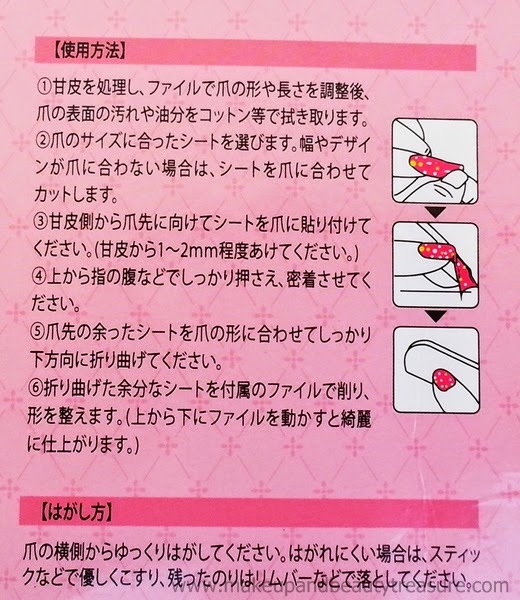 The pictorial steps make it easy to understand the procedure of applying nail wraps onto the nails. As soon as you open the casing you will find that the nail wraps are sealed in a thin plastic sheet. There is also a clear protective plastic sleeve that prevents the nail wraps from getting damaged. The nail wraps are stuck onto a smooth white card. 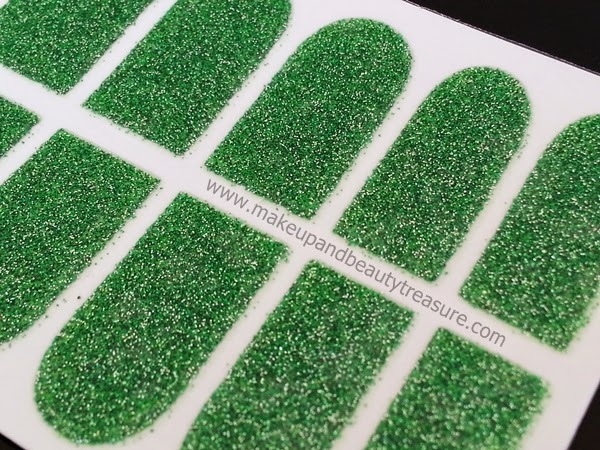 There are two rows of twelve nail wraps in the shape of nails. The nail wraps have soft and smooth texture and feels extremely light. They are dark green in color with shimmery and classy effect to it. These are awesome alternatives to applying nail varnishes. 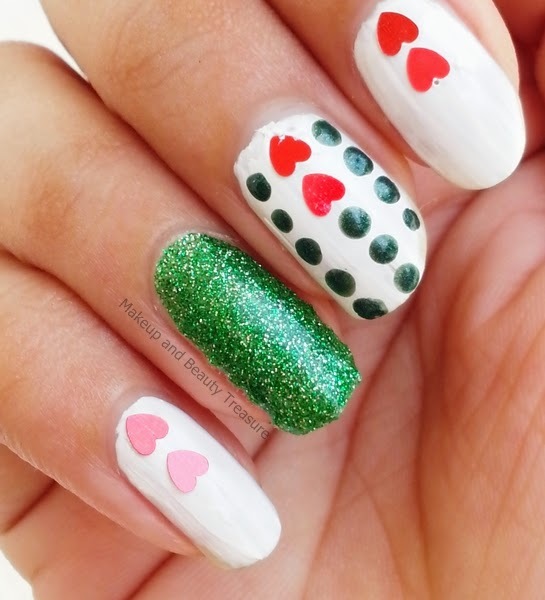 The green shimmery design adds an elegant touch to my nails. The nail wraps are stuck onto the card according to the nail size. The smallest ones are for pinky fingers and the largest ones for thumbs. Applying the nail wrap is super simple. You simply need to pick the right size wrap for each finger. • Peel off the nail wrap from the card. Heat it for about 10 seconds using a hair dryer. Press it gently using a finger onto the nail and trim it off to the size desired. Finish it off by filing using a filer to smoothen the edges. • Trim off the nail wrap to the size desired. Then peel off, heat it and apply it onto the nails. I use the first method but I do not heat the nail wrap using a hair dryer. I simply apply it onto my nails and trim off the excess. Then take a nail filer, bend the excess wrap and file it off in downward direction. This way you will get neat and non sticky edge. 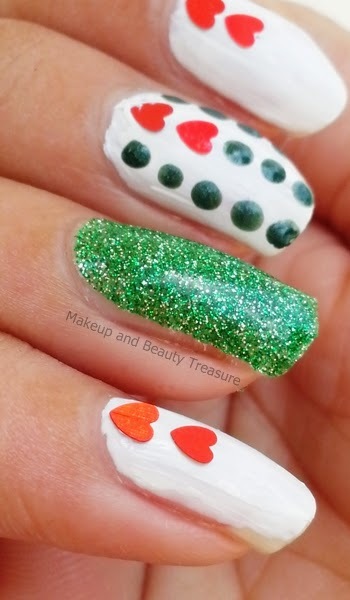 Make sure you lift the nail wraps from the flat edge as you need adhesive to stay put and apply the curvy edge at the bottom part of the nail. The nail wraps stay put on my nails for a good 3-4 days. To make them last longer, I simply apply a base coat, let it dry and apply nail glue. This way the nail wraps do not wear off for 5-6 days. The green shimmery nail wraps makes my nails look pretty and elegant. I get salon nails with just few bucks. I love applying it on my ring finger. If you a bride to be then I would suggest you to check it out. 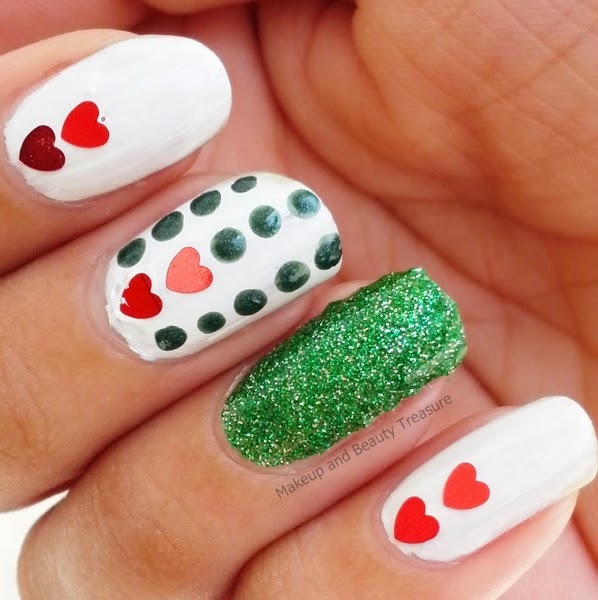 Apply these nail wrap on ring finger and red nail paint on the rest. The nail wraps feel extremely light on my nails and are easy to remove. My nails do feel a bit sticky after I remove them but that can handled using a wet sponge. • Perfect for bridal nails. 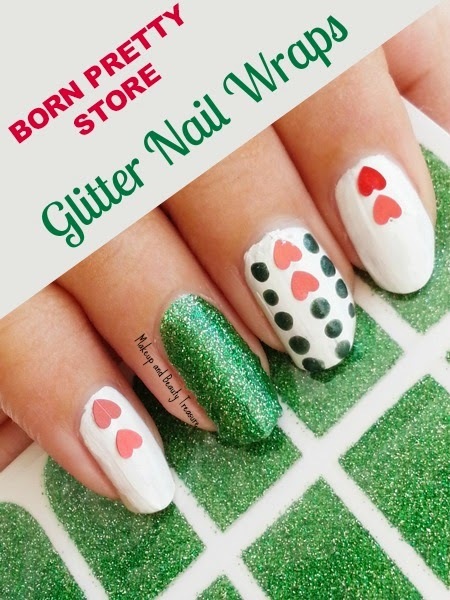 Born Pretty Store Green Nail Wraps is a superb alternative to nail varnishes. It not only feels light but stay put for a good few days without being dull. They do not feel sticky and looks elegant on nails. 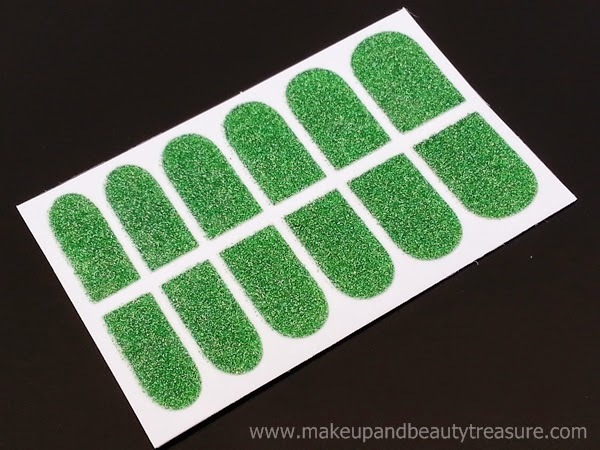 If you are a bride to be or love party nails then I would highly recommend these green nail wraps to you! Have you tried Born Pretty Store Green Nail Wraps? How was your experience? Do you use nail wraps? Share in the comments section below! Read my review on other Born Pretty Store products HERE!